Modeling 101 Webinar – April 4th. Register now and save! You asked….I answered! Sign up today for this 60 minute webinar that will give you a background on the industry and clear steps on how to get started. Find our if modeling is for you and your child. Cost of webinar is only $25! Register before April 1st and save $5. Use Coupon Code “MODEL” at check out! Whether you are new to the entertainment world or a seasoned veteran there are laws and regulations governing child labor across the country. In many states, the entertainment industry has special rules, laws, and permits necessary for minors to obtain and perform any work – paid or not. Laws vary from state to state but here are the basics. Be sure to check your state for laws that apply to you. You can do this via this link or visit your state’s government website for more information. In order to obtain a work permit most states require a completed form from the child’s doctor, their school, as well as their birth certificate and social security information. It can take 2-4 weeks to get a permit so apply as soon as you think you want to be in the industry. If you are in a bind and need one immediately – some states like NY allow you to apply for a ONE TIME temporary permit that is good for 14 days. Don’t waste it though because once you use it, you loose it! For many permits you may also need to show proof of a Uniform Transfer to Minors Act Trust Account (UTMA) or a New York State Uniform Gift to Minors Act Trust (UGMA) account or a blocked “California Coogan” type account. This is easy to set up at your bank and is for you and the employer (if your child books a job) to deposit at least 15% of your child’s earnings. Keep in mind there are regulations for how long your child can be on set based on age, and whether or not school is in session. There are laws regarding your child’s education and how many days a child can be away from school. Some productions require a tutor on set as well. As the parent, it is your responsibility to be aware of these things because an agent, manager, or even the people on set or production may not be aware or be in compliance – especially if they don’t typically work with minors. Take the time to do the research and ask questions if something is unclear. Want to know if your state regulates entertainment and requires a child performer to get a permit? Search here to get started! Ohlsson East is Scouting at a city near you! Live in the North East and looking for representation? You’re in luck! Top agency Ohlsson Model & Talent posted their east coast scouting schedule today on their InstaStory! Want a shot at meeting with their model scouts? Follow them on Instagram and send them a Direct Message with a cute, clear, clean & clothed photo of your child! But act fast because scouting takes place this weekend! Don’t live in the North East? They have a midwest office as well! Use the #ohlssonminisuper for a chance to be discovered on Instagram! P.S. One of our Mocha Babies was recently signed to Ohlsson after a few coaching sessions. Check out the exact photos that were submitted! A New Year Gift for You! I hope you all had a great holiday with your families and little Mochas! If you are anything like me you were planning and attending get togethers, wrapping gifts, baking cookies, visiting family and spent at least one (or two) days in your pajamas!! How I wish the time went by a little bit slower, but I am grateful for a chance to decompress, reflect and focus on what is really important to me….my faith and my family! Since it is the first Monday of 2016 I want to share that my main goal this year is to plan and organize my chaotic life a bit better. I thought you may also have a similar goal so I created some checklists to help you jump start your Mocha Baby’s modeling career. I will continue to add new resources for you to download throughout the year! Have some suggestions you would like to share or information you would like to know? Email me at mochababymodels@gmail.com or leave me a comment. Get your free downloads here! Does your child have his SAG-Aftra card? Perhaps he has a few waivers and is approaching a “must join” status. 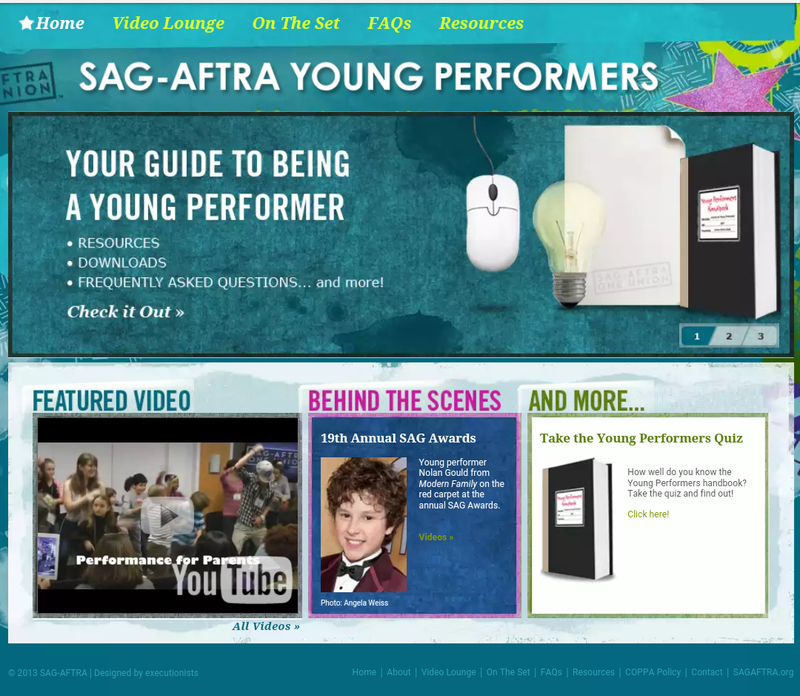 The Screen Actors Guild has a great new place for young performers to get information and resources about being a part of the union. There are answers to frequently asked questions, news and industry updates and behind the scenes videos. One of the coolest features is an interactive animation of a set that describes all the production people as well their names and roles. Check it out with your little performer and bookmark the site so he can visit it often! Insider Advice from the Pro’s on How to Photograph your Children! When it comes to getting started in the modeling industry, parents always want to know if they need professional photos. I think this has also been one of the major ways scammers have taken advantage of eager parents looking to make their kids a star. They sell them a photo package with a few looks and not only do the parents end up out of a couple hundred, or even thousand dollars – the child never gets called for an audition. And you can forget actually finding representation or booking a job. I have mentioned on this blog numerous times that you do NOT need professional photos especially for kids under 3 years old because kids change their look so rapidly. In fact, the agencies expect updated photos every month! That could get very expensive! But just because you don’t need to pay for photos it doesn’t mean your photos can’t and shouldn’t look professional especially with the high tech smart phones we all have. Most agency websites tell exactly the types of photos that want to receive. I came across this great article from industry professionals on how to get great photos of your kids. Their advice? Lose the Cheese! Want to see what the other 5 experts had to say? Check out Lose the Cheese: 6 Experts Share Their Tips on How to Photograph Children.